So many muffins you buy, lemon poppy seed or any kind, are actually cupcakes, loaded with sugar. The reason I often prefer a muffin over a cupcake is that it is supposed to have a lot less sugar. And jumbo muffins? Uh uh, not in my house. If anything, I'll downsize to mini muffins just because they are so cute on the tea table! I love poppy seeds. Not sure why. I couldn't describe their flavor to save my life. But I love the crunch. Every time I make something with them I think of the Seinfeld episode where Elaine's poppy seed bagel habit made her test positive for opium. Wonder if that could really happen? If you're not a poppy seed fan, you might like my Blueberry Muffins. Either one is great for breakfast or elevenses. Excuse me while I put the kettle on! 1 Preheat oven to 400F/205C/Gas6. Grease a standard 12-muffin tin or line it with paper bake cups. (I prefer to bake muffins in a greased tin, but I just happened to have a dozen of these pretty yellow bake cups.) In large bowl, whisk together flour, sugar, baking powder, baking soda, salt and poppy seeds. 2 In 2- or 4-cup glass measure, melt the butter in the microwave; cool slightly. Whisk in milk, eggs, oil, lemon zest and lemon juice. Add thoroughly mixed wet mixture to thoroughly mixed dry mixture. Mix as little as possible, just until dry ingredients are moistened. 3 Spoon the batter evenly into twelve muffin cups (I use a 1/4 cup measure to fill all the cups, then go back with a spoon to divide the remaining batter). Bake for about 15 to 20 minutes or until lightly browned and a toothpick inserted in a center muffin comes out clean. Serve warm. Optional: Make a simple glaze with 1 cup powdered sugar and 2 to 3 tablespoons lemon juice. Drizzle over slightly cooled, but still warm, muffins. Jean- Those are probably my favorite muffins in the whole world. Would you believe that my ovens (5 years old mind you) have not been working since mid-October? I am at my wits end and we are waiting to see what Bosch is going to do. This is our second OUTAGE with the double ovens and now they are saying they don't manufacture the part anymore. FIVE years!!!! Crazy! Anyway-wanted to tell you this- Did you know that you are a No Reply blogger when you leave a comment? No one can respond to you without back-tracking to find your blog. If you are interested in fixing it here is the link to do so. That is a ridiculous problem you are having with your ovens! Surely there is someone who can get this resolved for you. That is totally unacceptable. Now I know what I'm going to do with at least one of the lemons I harvested off our tiny "Charlie Brown" lemon tree. I love poppy seeds muffins. I'm extra glad you said these aren't too sweet either! Richard, I hope you like them! My husband just asked me to make them again. That's a good sign! Can you believe lemon is my most favorite flavor and chocolate? These look wonderful. Diana is right - your comments do come back No Reply - and there is no way to answer you directly! I love that cat too. And I have stopped with the cokes all together. So what is your email address? Thanks, Chatty Crone! Lemon (and other citrus) is definitely my favorite flavor. I have to be in the mood for chocolate! Citrus and poppy are wonderful together. These muffins look fantastic, Jean. 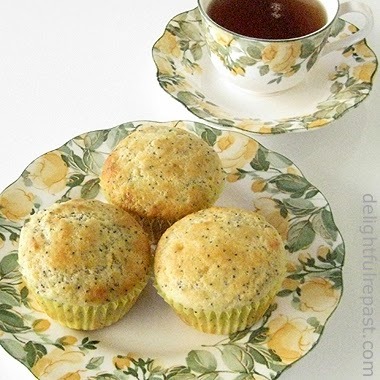 I adore lemon poppy seed muffins too, they are truly one of my favorites! Angie, thanks. Think I'll be doing more with poppy seeds now. Loving that crunch. Jenn, I even cut back on the sugar a bit when I make cupcakes, so I sure don't want a lot of sugar in my muffins. Thanks, yummychunklet. Making them again tomorrow morning! OK, ‘fess up, you are a vampire. How else can you crunch a poppy seed? That’s like fracturing a diamond, isn’t it? Pointy teeth on an anvil – that’s the only way I can see to do it. The little buggers just slide off my mastication teeth. And I always imagine them base jumping down the trachea and lodging somewhere past the splenic flexure to fester until discovered five years later in a colonoscopy. I’ll take my opium inhaled, thank you. And alas, neither cupcakes nor muffins make my cut for minimal bread consumption. But I like to look at the little lumps. Like you say, “cute.” There has never been an adult muffin or cupcake. They are all toddlers, sitting there overflowing their paper diapers – baby fat-wise, I mean – just waiting to be pried out and powdered…with sugar. Wow, just Wow, Sully! If only I could weave such a tale about a simple muffin! Those look so good! Anything with lemon is good to me. Yes, Greg (SippitySup), I think you're right - a fruit aftertaste. Oh Jean, they look scrummy! I love lemon muffins, I must give your recipe a try! Rachel, I hope you will! And do let me know how they turn out for you. Come back in a week or two for my cream scones. I mirror NanaDiana's sentiment, the combination of lemon and poppy seed is exquisite. And as much as I'd love a jumbo muffin, these are the ideal size. Lovely post, Jean! Brooks, thank you! Just thought of you yesterday when I started planning my next cake (which, of course, will not be as fancy and beautiful as yours!). Love poppy seeds and lemon so these would be a hit in my house. Thanks, Melissa. I hope you'll try it soon. I love that china, too, and I only have a few pieces of it. Magnolia, thank you. It is a classic combination. I agree with you, Jean. I like my cupcakes to be cupcakes and my muffins to be muffins. Your lemon muffins look lovely! Thank you, Kim - well said! I know what you mean about "muffins" being giant cupcakes in disguise. I used to buy "muffins" from my old office and, while they were perfectly nice, they had this rich chocolate gooey core! Totally not what a muffin should have... that there is cupcake territory! Thanks, Charles. Yes, I do love a tangy lemon glaze, too, on many things. So refreshing! I'm always looking for great lemon recipes, and looks like you've nailed it with this one. Those look and sound scrumptious and a definitely great use of some home grown lemons. I'll give em a go next time I have some spare lemons. Thanks, Grant! I hope you will enjoy them with a nice cup of tea.